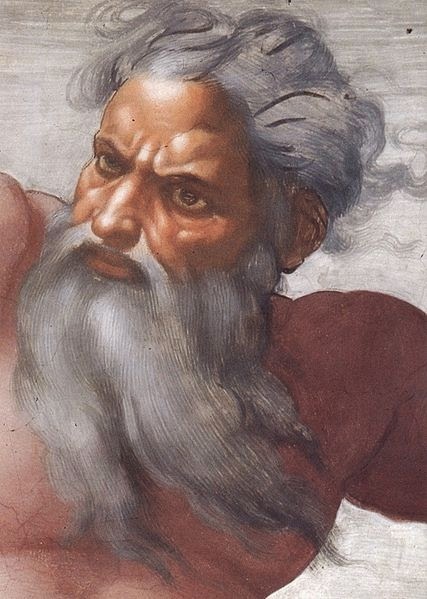 This is the face of God; as depicted by Michelangelo in the Sistine Chapel. If he looks angry he has good reason. People are misrepresenting his words again. Bear in mind, this is not a post about abortion. Rather it is about the misrepresentation of the Holy Bible for political purposes. It is an issue I feel very strongly about and I hope that you will understand the point I am trying to make. That is; no matter what your views on the topic of abortion may be; it is never okay to misrepresent the Bible. It means too much to too many for it to be politicized by any group, for any reason. Sometimes politicians and political groups do us a favor when they send out their propaganda. Last week was one of those times. I got a big, over sized postcard type of advertisement about voting for Pro-Life candidates in the recent election. There’s nothing wrong with that; this is America. We encourage that sort of thing. It’s healthy. The only thing I find objectionable about it is that they quote 2 words; completely out of context; from Deuteronomy 30:19. They have adopted these 2 words as their clarion call although they have nothing to do with abortion. I call your attention to the use of these 2 words; “Choose Life”; as a false way to make a case concerning abortion; either for or against; with anyone who is familiar with Deuteronomy. Not only is it disrespecting of the Bible; but it also assumes a certain ignorance on the part of the reader. And, in this case, that reader is me. So, I asked several different people with whom I interact in the course of the day where the quote “Choose Life” came from. I made sure to ask people that I know well enough to preface the question with “Do you go to church?” I also asked if they were Pro-Life. I asked people with these beliefs because it is their groups which have been using the quote. It would have been pointless to ask this question of people who do not believe in God, or are Pro-Choice. It broke down to only 2 people; out of a total of 5; even knowing where the phrase “Choose Life” came from; other than a vague reference to “it’s in the Bible.” And of the entire group not one could tell me how it related to abortion at all beyond the obvious quotation. And there’s a good reason for that. It doesn't. Deuteronomy 30:19 taken out of context is a nice slogan; period. It has no reference to abortion; either for or against. It is troubling to me on several levels that so many people have been using this slogan for so long without even questioning its context. It’s kind of like when Obama was going to that church in Chicago with Jeremiah Wright and claimed not to have understood what Reverend Wright was saying when he dammed America. For years the President claims to have sat there without knowing; or apparently even listening. No one believed him, including me. But if this Deuteronomy thing is any indication of how people do not listen; but blindly follow religious leaders; then perhaps I was being too harsh on the President. Deuteronomy 30:19 is the conclusion of the thoughts begun earlier in the chapter; particularly sections 30:17 and 30:18. Please grab your nearest Bible and read for yourselves. I have used a 1985 King James Version placed by the Gideon's; commonly called a Gideon's Bible. Technically this is a New King James Version Bible and the translation most commonly used by Christians worldwide. I don’t mind differing political points of view. As I have said, I find that to be healthy. What does make me mad are the organizations who play upon the religious emotions of uninformed people like a harp. And it’s especially annoying to me when people misquote the Old Testament out of context to make their political point. Not only that; it actually serves to undermine the credibility of their point of view.